Burnley’s Urban River Enhancement Scheme or “URES” for short undertook an ambitious programme of activities to improve Burnley’s natural river heritage. 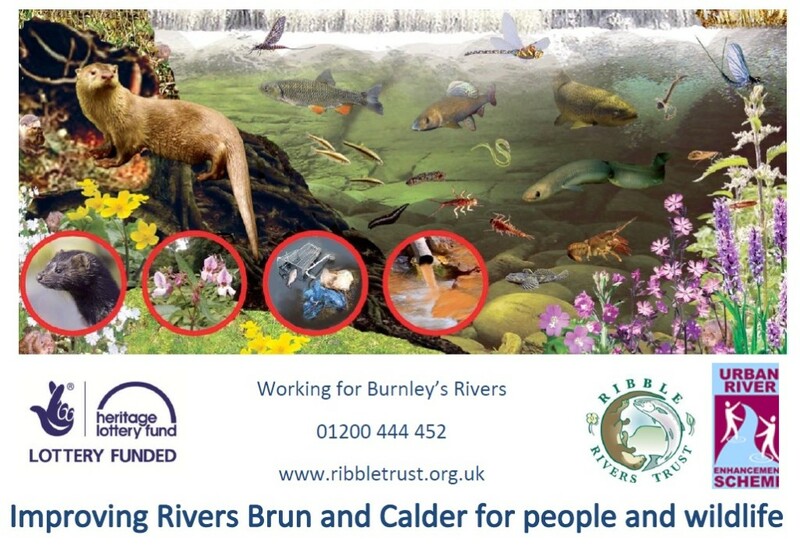 As well as carrying out large scale construction works in the river channel URES worked with local people to involve them in helping make physical improvements to our rivers as well as raise awareness of the wildlife associated with the rivers in Burnley. One of the key aims of URES was to begin the process of changing local perceptions and attitudes towards our rivers (from one of neglect and abuse towards appreciation and enjoyment). Highlighting the benefits of our rivers to both people and wildlife URES nurtured a step change in our understanding. Working with thousands of people over four years URES volunteers contributed over 52,000 hours of volunteer time towards the project and thousands more local people have taken part in local events, educational workshops, guided walks, talks and presentations, hatching trout eggs in school, arts and crafts, drama, film making, photography and much more. ‘I didn’t even know this was a river, now I take my family for walks by the river and I enjoy watching the heron and identifying different species of trees and wildlife, it has changed my life…’ Volunteer completing the River Habitat Training course. Changing the fast flowing and narrow river channel into a more natural series of wide ‘pools’ and ‘riffles’. As well as connecting riverine habitats upstream and downstream of Burnley the work to re-profile thousands of stone setts lining the river channel will both oxygenate the water and provide resting places for fish and fresh water invertebrates increasing local biodiversity and improving the quality of the river habitat. A brief summary is available here Case Study Physical improvements and more detail is outlined in Physical Works. Improving access to Burnley’s river network included the installation of a new bridge over the river Brun, new and improved footpaths along both the river Brun in Brun Valley Forest Park and the river Calder in Towneley Park. The renovation of riverside railings and bridges, installation of riverside artwork, heritage and wildlife information and interpretation panels, viewing windows, landscape improvements and the co-ordination of dozens of guided walks and hosting of hundreds of volunteer days directly involving local people in physically improving their own river habitats. A brief summary of the access improvement work is available Case Study Access improvements also see our new guided walk at Shedden Clough (source of the river Brun) Geotrail and our Treasure Trails which are a fun and interactive to enjoy and bring to life our natural river heritage and suitable for all ages and group sizes. For teachers and/or group leaders here is the Educational Resource Pack which provides curriculum links and other useful background information. Training and education were also a large part of the work of URES. Our aim was to reach as many people as possible including local residents of all ages, backgrounds, interests and abilities and in so doing to initiate a step change in local hearts and minds. To achieve this URES worked in partnership with dozens of local community groups, organisations, schools and businesses to deliver a broad programme of activities and events and generate a legacy of local action groups confident and equipped to continue the work URES has begun by maintaining their local river. Short course in River Habitat Management, with support of The Workers Educational Association (WEA) this short course was designed to increase practical skills, confidence and awareness of the importance of river habitat management as well as event management and how to plan, prepare and manage practical activity days working with volunteers. Over 30 people completed this training course during the lifetime of URES many progressing onto further education, volunteering, employment and/or self employment in the environment sector. Feedback from students can be seen here: Case study River Habitat Course. For more information about upcoming courses please contact WEA North West region. Over 500 primary school children enjoyed the URES River In The Classroom project. Following Teacher Training courses the participating schools maintained a fish tank and chiller unit in their classroom receiving 100 trout eggs in January, watching the ‘eggs’ hatch, looking after the young fish through their delicate ‘alvin’ stage and growing up to become young brown trout ‘fry’ before releasing them into their local river in Burnley. In the wild just one egg in a hundred (1%) usually survives to grow into a young fish. In comparison the young people of Burnley successfully achieved a survival rate of over 80% on average releasing a total of over 1400 brown trout into our rivers. For more information see this project summary: Case Study River in the classroom and for ideas of more activities to do yourself see our Creative Worksheets for River in the classroom and visit the blog of the artist ‘Creeping Toad’. URES worked with Burnley Youth Theatre on our When You See Water project. Over 900 young people of all ages and from all different communities throughout Burnley enjoyed drama workshops and learned about the river habitats and wildlife as well as exploring their own interpretation of ‘when I see water….’. Burnley Youth Theatre held auditions and formed a core performance group who delivered a choreographed movement piece set to the resulting audio recording generatrated by the drama workshops. Over 240 young people then took part in making giant puppets, costumes and displays and performed in an outdoor carnival in April 2014. Watch this excellent short film about the WYSW project. URES worked with Burnley Council Arts Development Team, now Burnley Leisure Trust on the Creative Rivers In Burnley (CRIB) project. This was to spark the creativity of young people in Burnley and while they explored and learned about the rivers they also learned about photography, film making, audio recording, sculpting and craft work with a range of materials including the use of multi-media software. These skills enabled them to gain an Arts Award, a nationally recognised qualification, as well as enjoy experiences exploring our ‘underground’ rivers. Renamed by the young people participating as Undercurrents this project supported dozens of young people through their arts award qualifications, trained staff at Burnley Library to become Arts Award Assessors, organised presentations and arts and crafts activities at public events and key venues including Burnley College and Burnley Autism Resource Centre. For more information please see this summary Case Study Undercurrents. Designed to reach the communities of Daneshouse and Stoneyholme the URES Stories in Stone project was delivered in partnership with Burnley Fire Station and the Burnley based Love and Ettiquette Foundation. To inspire a sense of place and explore links with the rivers in Pakistan and Bangladesh with the rivers of Burnley Stories in Stone delivered a presentation in Goshia Mosque, hosted treasure trail walks and stone carving workshops at Burnley Faith Centre. The resulting community generated stone sculptures have been placed in a riverside feature celebrating and regenerating the area. The success of the partnership working of URES was a highlight of the celebratory closing conference when in March 2015 URES hosted the Rivers Trust Spring Conference 2015.